When I last visited Singapore two years ago, the Gardens by the Bay which opened in June this year was just a building site but now it has been transformed into a botanical wonderland. 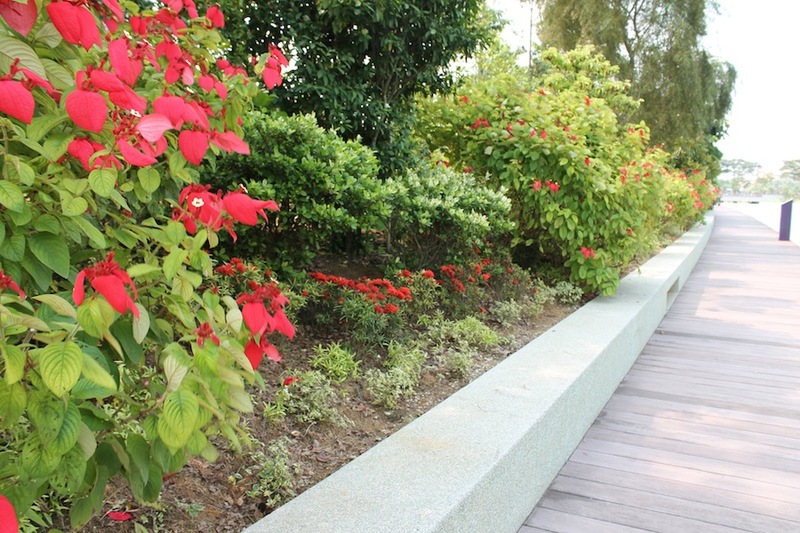 It is tempting to think of the Gardens as a type of Disneyland but this would dismiss the serious aspects of the project which include extending the Garden City theme of Singapore and providing education on environmental issues. Many of the great gardens that we admire today started life as show pieces meant primarily to impress and to entertain. 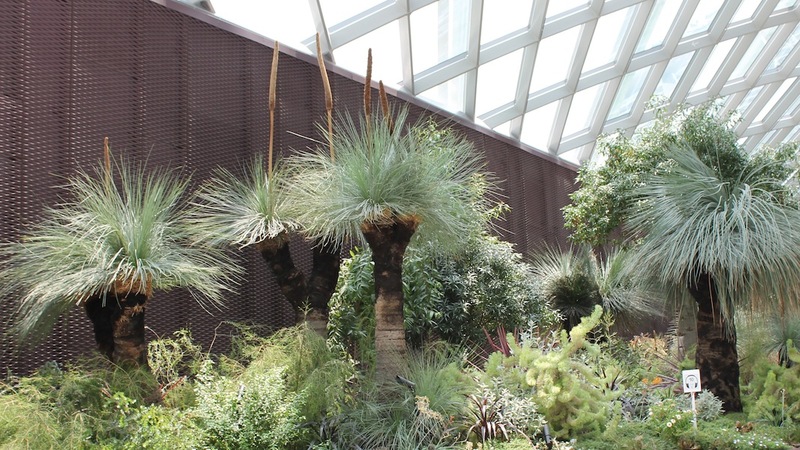 I imagine that the glasshouses at Kew were marvelled at when they were first shown to the public and the two new glasshouses at Gardens by the Bay are certainly impressive by today’s standards. Even more spectacular are the Supertrees which tower over the gardens – not only are they visually striking with vertical gardens clothing the “trunks” but they also incorporate an array of technologies into the “canopies” which contribute to the sustainability of the whole site. 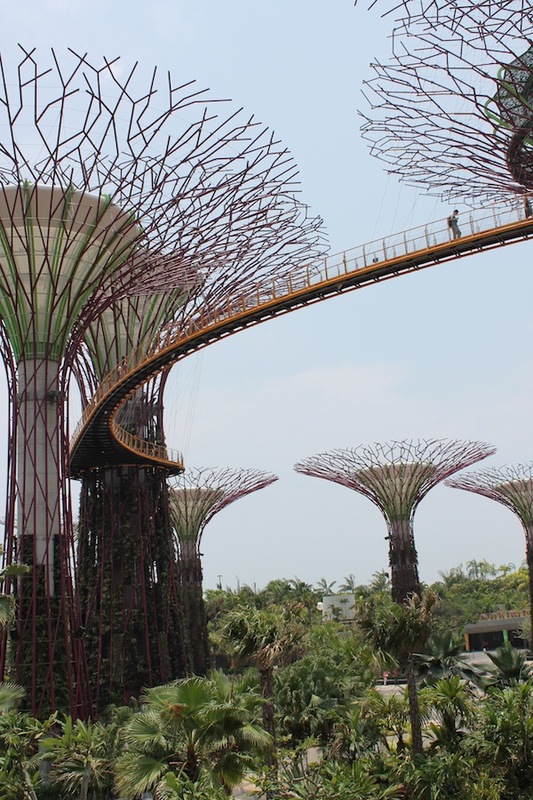 There is a skywalk which links some of the Supertrees and allows for a great view of the Gardens. 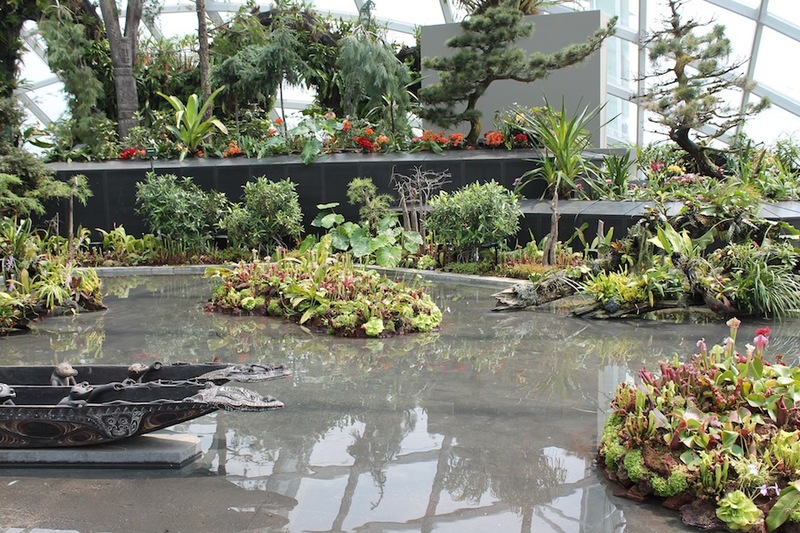 The two cooled glasshouses each have very different purposes – the larger one is known as the Flower Dome and it houses collections of plants from around the world that prefer a Mediterranean climate. 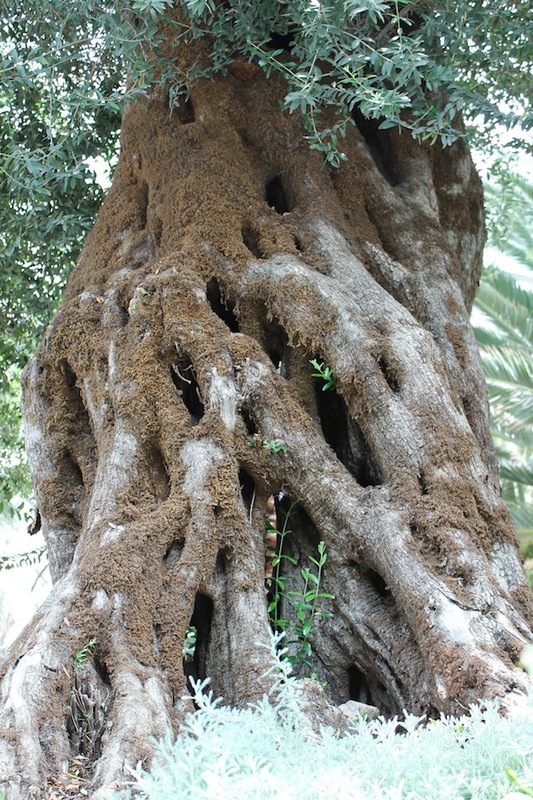 Huge specimens of palms, boabs and olive trees have been transplanted to create instant gardens. The Australian garden is one of the healthiest that I have seen outside of Australia but it is early days yet. At the time of my visit, the central flower display featured the autumn harvest with lots of yellow, orange and red flowers, mixed in with vegetables. 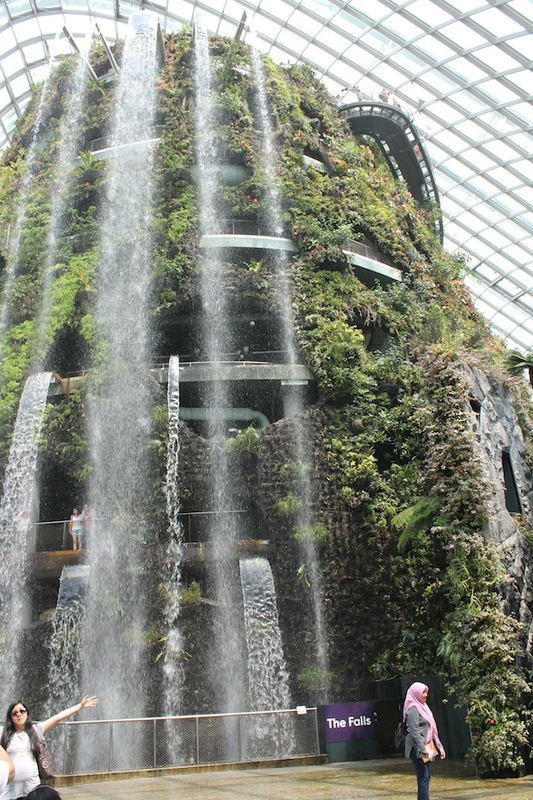 The smaller glasshouse is known as the Cloud Forest. Entering this dome is a WOW moment. A 35m tall “mountain” with half a dozen or so waterfalls gushing down to the ground makes for a show stopping “Raiders of the Lost Ark” type scene. Kids and the young at heart will love this display as they weave their way up to the top via suspended walkways. The Cloud Mountain is covered with plants such as ferns, Rex begonias, bromeliads, orchids and various other plants that prefer a cool moist tropical atmosphere – the white moth flowers of the phalaenopsis orchids were amongst those flowering during my visit. 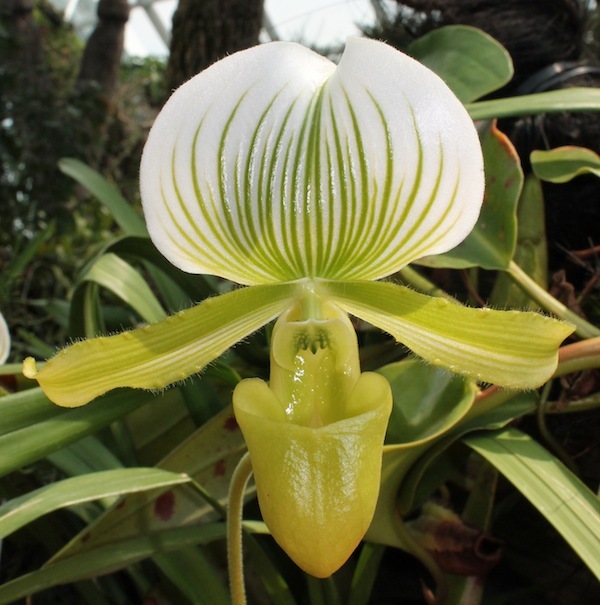 At the top of the “mountain” a huge variety of orchids and tuberous begonias were also in flower and islands of fascinating carnivorous plants float in a small “lake”. The ‘educate and inform’ areas below the mountain had displays and videos about global warming and the sustainable features of the Gardens. As the Gardens are so new there are still some features such as the vertical gardens of the Supertrees and the Cloud Mountain that haven’t reached their full potential yet but the displays should be even more stunning in a few years time. In addition to the Domes and Supertrees there are hectares of themed gardens and landscaped parkland incorporating lakes and waterways. 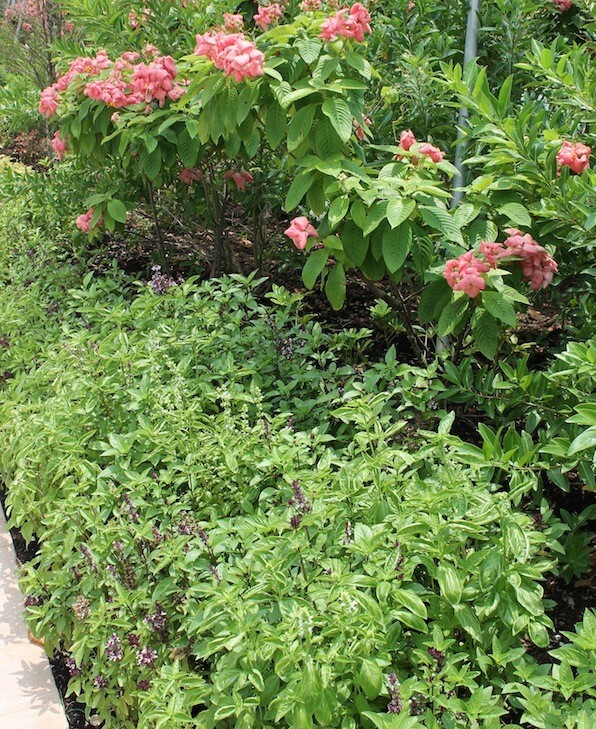 These areas are generally planted with lush tropical plants which are appropriate to the environment. Despite all of this grandeur there are plenty of design ideas to inspire home gardeners no matter where they live. 1. The use of basil as a small hedge along a path in the Scented Garden. It’s great to be able to incorporate edible plants into the flower beds and of course the basil emits a delicious aroma. 2. The high wall in the Chinese garden is obviously needed to screen out the overlooking buildings. 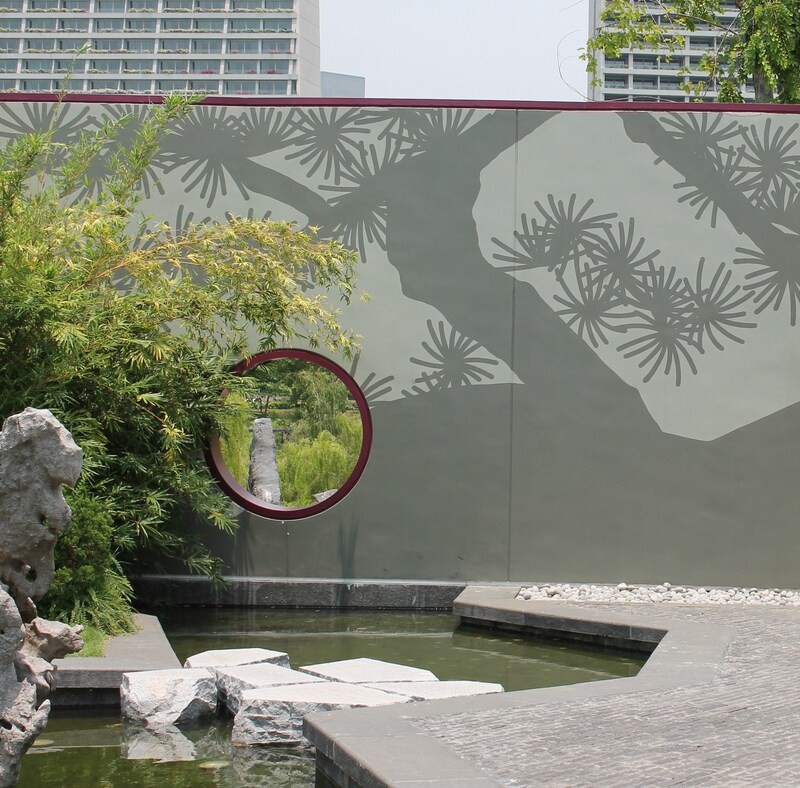 In places where the wall itself can’t be screened with planting it is painted with images to suit the theme. The circular window placed low in the wall also draws the eye down away from the buildings and through into another section of the garden which adds a sense of depth and perspective. These ideas can be adapted to city gardens and courtyards which are surrounded by high walls or tall buildings. 3. 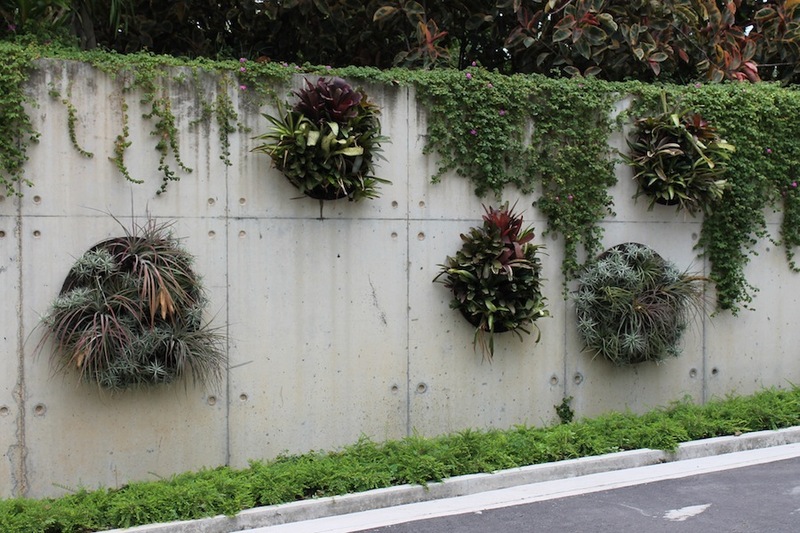 Another way to make a tall wall look more interesting and green is to use circular disks of vertical gardens – a modern take on the hanging half basket common in the 70s and 80s. 4. I particularly like the use of colour in the Gardens. 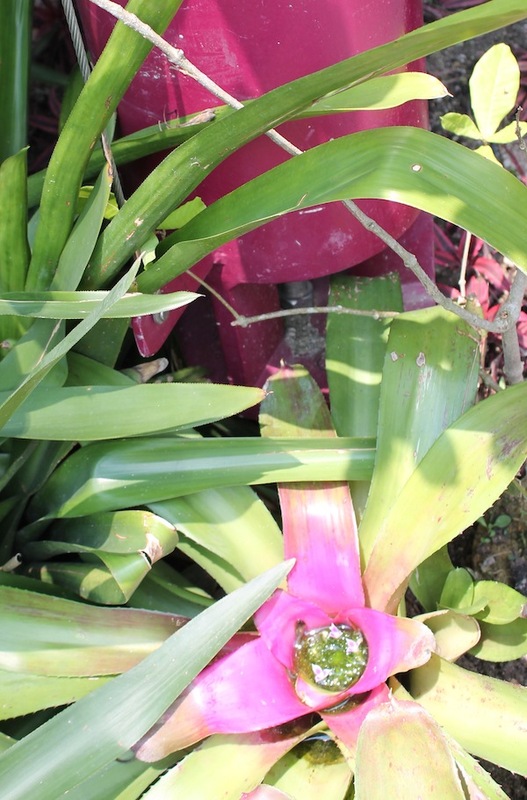 The pink/magenta colour of some of the bromeliads in the vertical gardens of the Supertrees is picked up in the colour of the steel structure. In the home garden the colour of cushions, tablecloths or even the outdoor furniture in the alfresco area can pick up on the colour of flowers or foliage in the adjoining garden. This emphasises the colour of the plants. 5. 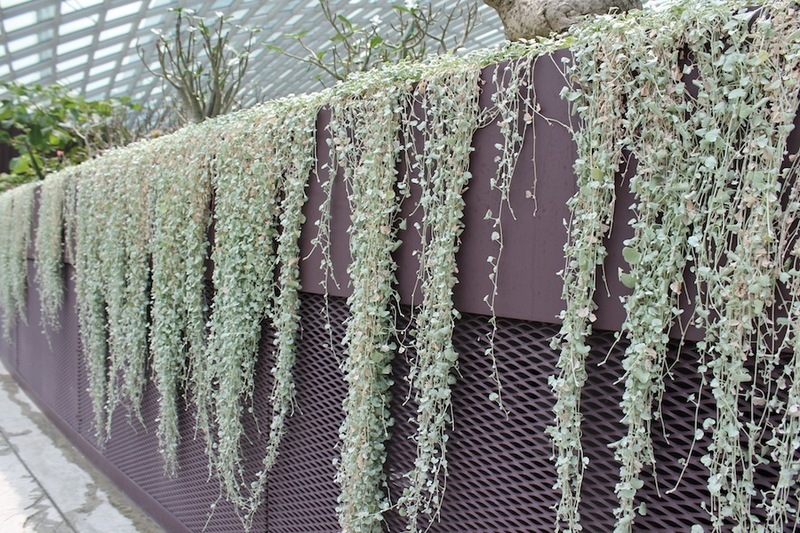 The cascading Dichondra Silver Falls in the Flower Dome perfectly contrasts with the mauve walls. The hot tropical pink/magenta of the Supertrees would be too harsh and overpowering in this situation. 6. 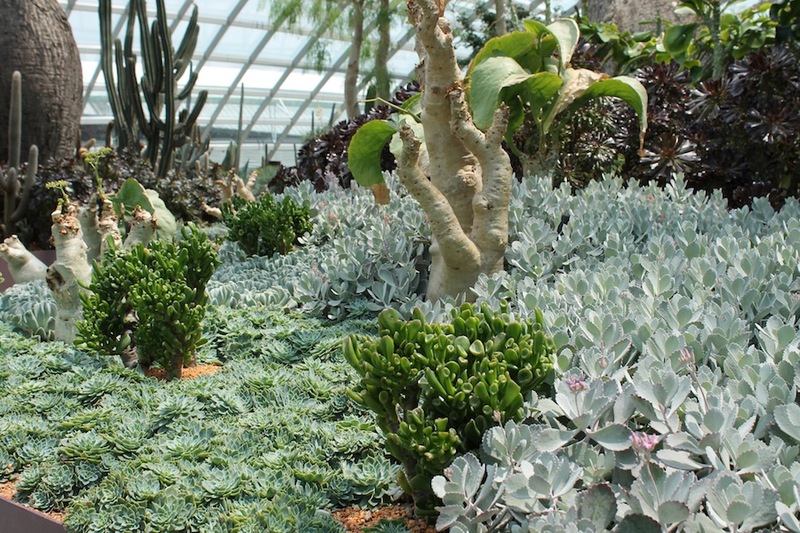 The mass planting of the succulents allows the full beauty of the various colours, textures and leaf forms to be highlighted. In private gardens eclectic collections of succulents and cacti in pots can look fantastic but too many different varieties planted in a garden bed can look messy and detract from the beauty of the plants. 7. Wide retaining walls provide additional casual seating – advice is often given to home gardeners that the walls of raised garden beds can double as seating but in practice the walls are usually too narrow to be comfortable and they often become overgrown with plants If seating on the retaining wall is required then I think it is best to specifically design for it by ensuring that the wall is either wide enough or that it has a wide capping of stone or timber on top and that it is at a suitable height otherwise let the planting soften the look of the retaining walls. Those are just a few of the many features that could provide inspiration when designing a domestic garden. I hope that I can visit the Gardens by the Bay in a few years’ time to see how they have matured. I am in awe at the scale of this development! Singapore’s commitment to becoming the Garden City is certainly being realised on a grand scale. Although it does seem to have a theme park quality about it, your comparison to the giant glasshouses of yesteryear in our Botanic Gardens is quite valid. Do you think that Singaporeans benefit from GbtB too, or is really aimed at tourists? 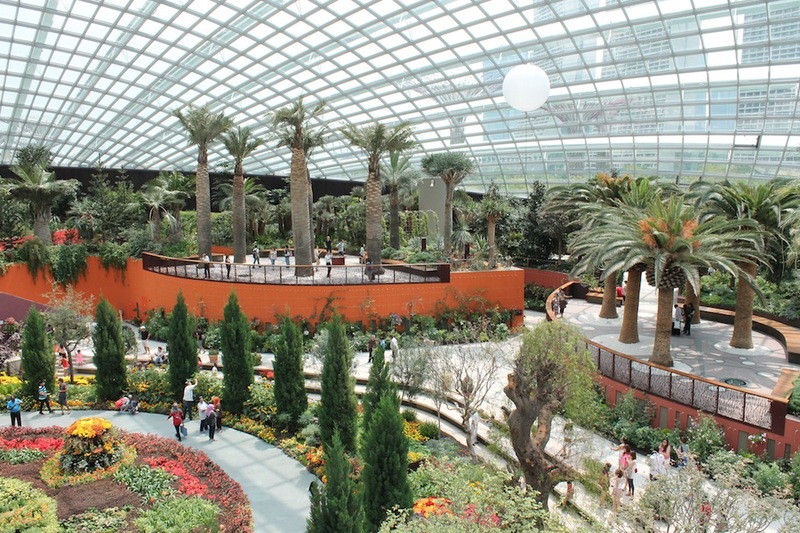 The GbtB is certainly designed for the Singaporeans to enjoy – entry to the gardens is free so it is really like a large public park. The fees for the glasshouses and tree walk are discounted for the locals and there are at least half a dozen restaurants and cafes within the grounds which encourages repeat visits to the gardens. There are various venues that can be used for functions including the Meadow (capacity 30,000 people) which can be used for outdoor concerts and fairs etc. I imagine that there will be a constant stream of schoolchildren visiting the gardens as there are lots of innovative features that make learning about the environment interesting and fun. I guess you can tell that I was pretty impressed. I spent a whole day there a month ago and I was impressed. The sheer scale of the construction and plantings is very impressive and they are adding more gardens. My only concern was the weeds creeping into the plants high up in the vertical walls in the wet class house — how will they ever weed that effectively. A must see if you are in Singapore. Thanks for this post. We are travelling to Singapore for the first time in a couple of weeks, and I’ll definitely be adding this to my list of places to see while we’re there. It reminds me a bit of The Eden Project in the UK in its aims, although on a much bigger and more urban scale. Unfortunately I haven’t been to the Eden Project but I read a review of the Gardens by the Bay in the Garden History Journal yesterday and the reviewer thought the same as you. Linda, thanks again for the tip. We visited the gardens last month and they are pretty dazzling! 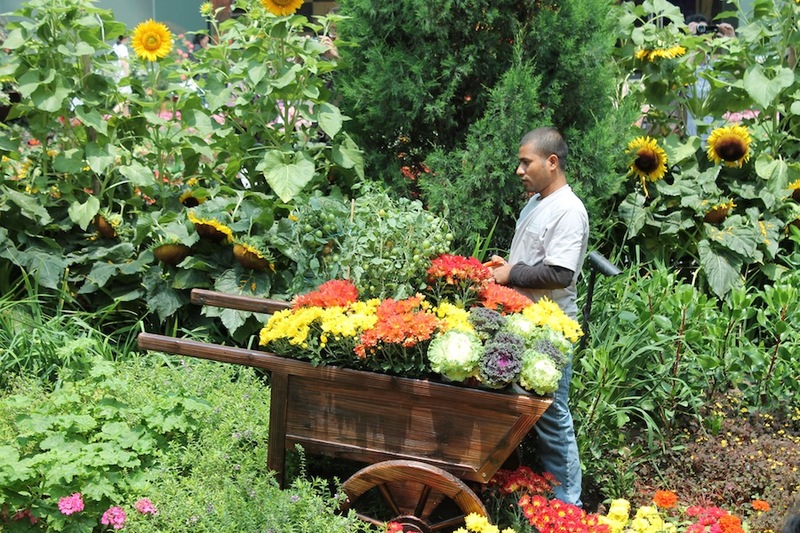 I somehow couldn’t warm to Singapore as a place, but its efforts to become the world’s best garden city certainly provide much fodder for us garden-lovers. Glad you enjoyed the gardens. Singapore is a great place for those who love their retail therapy but if you aren’t into that then it can be tricky finding places that you can relate to. On our last trip we got “lost” in a kampong built in the 1930’s – low rise buildings, hardly any cars, no tourists in sight and only a few local shops – so different from the main tourist areas. 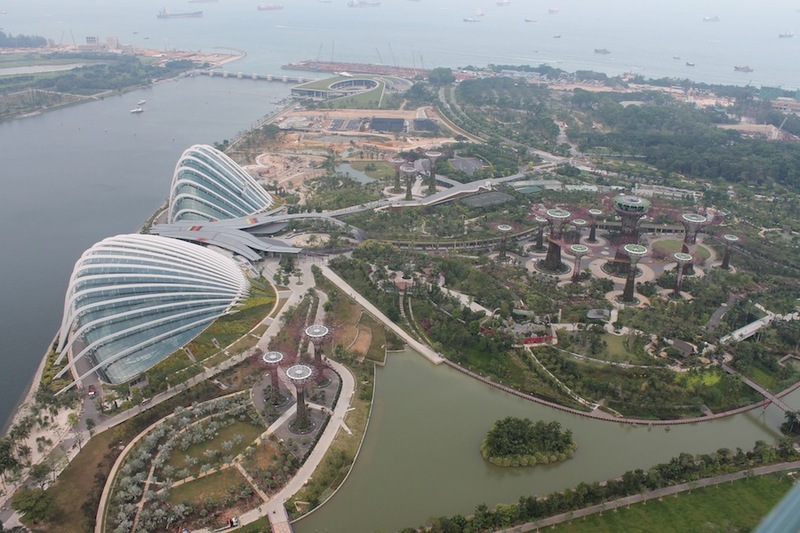 Next trip I would like to visit the wetland reserve on the north of the island and of course see the latest developments at the Gardens by the Bay.